In the standard version the work in the mode transmit and receive with the same (PE) or another transducer (TT) is possible. It is possible to use an additional multiplexer and work with multiple probes. motors with high gear ratio and microsteps are used. - High speed, high accuracy and resolution are characteristic features of the OPSCAN 4.0. - A wide range of measuring ultrasonic probes is available. 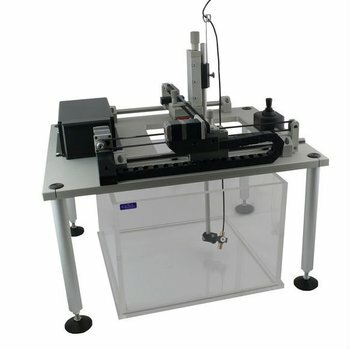 - The system has the option of manual positioning of the measuring probe. axis, there are possibility continuous and start-stop work modes. - Visualizations: A-scan, B-scan, C-scan (2D and 3D). - Dimensions of the scanner can be changed to meet customer requirements. - Body design allows to insert the scanner to a larger water containment.